At Black Hat USA 2011, I presented the research that lead up to the 44 vulnerabilities addressed in MS11-034 and MS11-054. These vulnerabilities were indirectly introduced by the user-mode callback mechanism which win32k relies upon to interact with data stored in user-mode as well as provide applications the ability to instantiate windows and event hooks. In invoking a user-mode callback, win32k releases the global lock it aquires whenever making updates to data structures and objects managed by the Window Manager (USER). In doing so, applications are free to modify the state of management structures as well as user objects by invoking system calls from within the callback itself. Thus, upon returning from a user-mode callback, win32k must perform extensive validation in order to make sure that any changes are accounted for. Failing to properly validate such changes could result in vulnerabilities such as null-pointer derferences and use-after-frees. The slide deck for the Black Hat presentation as well as the accompanied whitepaper, outlines several of the vulnerabilities that may arise from the lack of user-mode callback validation. In particular, we look at the importance of user object locking, validating object and data structure state changes, and ensuring that reallocatable buffers are sufficiently validated. In order to assess the severity of the mentioned vulnerabilities, we also investigate their exploitability and with that, show how an attacker very easily (e.g. 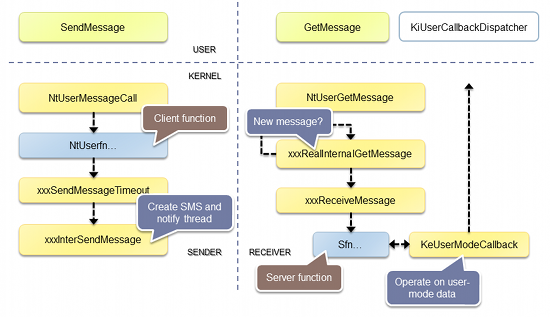 using kernel pool or heap manipulation) could obtain arbitrary kernel code execution. Finally, because vulnerability classes such as use-after-frees and null-pointer dereferences have been (and still are?) extremely prevalent in win32k, we conclude by evaluating ways to mitigate their exploitability. In retrospect, Black Hat USA and DEFCON stands out as one of those great conferences where you get to meet many interesting people and can run into just about anyone. Having spent what now seems like a lifetime in win32k (ok, I may be loosely exaggerating…), meeting one of the past developers of the Window Manager whose code I had torn to pieces (sorry! ), was one of those great moments that will be remembered for years to come. I also want to use this occasion to extend my gratitude and thanks to everybody that showed up for my talk. Your feedback is highly appreciated, and I would probably not have been doing this if it wasn’t for you guys. See you on the flipside! In VirtualBox 4.0.10 and the Critical Patch Update for July 2011, Oracle addressed two vulnerabilities that could be leveraged by an attacker to gain elevated privileges in a Windows guest (CVE-2011-2300) or execute arbitrary code on the host (CVE-2011-2305). The former affected the VirtualBox XPDM display driver, installed on Windows guests as part of the VirtualBox Guest Additions, while the latter was a vulnerability in the VirtualBox 3D graphics stack, resulting in host memory corruption. Before we look closer at the details of these vulnerabilities, we’ll briefly review the Windows 2000/XP display driver architecture. 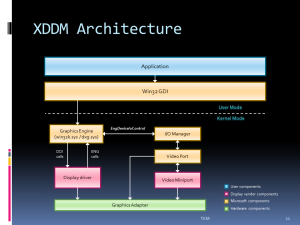 In the XPDM architecture, every graphics adapter is associated with a display driver and a corresponding miniport driver. The display driver is essentially a DLL whose primary responsibility is rendering. It is written for any number of adapters that share a common drawing interface and hooks drawing operations offered by GDI (win32k) to enhance performance. The display driver also has direct access to video hardware registers for time-critical operations. 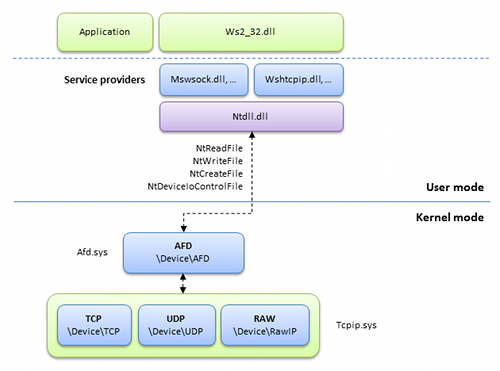 The video miniport driver generally interacts with other NT kernel components as is written specifically for one adapter (or family of adapters). It manages all the resources shared between the video miniport driver and the display driver, and handles hardware initialization, mode sets, and physical device memory mapping. Notably, the video miniport driver can only make calls exported by videoprt.sys. In order to request support from the video miniport driver, the display driver calls EngDeviceIoControl with a control code specific to the desired operation. A display driver may implement a number of different graphics DDI functions depending on the drawing operations to accelerate or features to support. In general, DDI functions are grouped into three categories: functions required by every display driver, functions required under certain conditions, and functions that are optional. 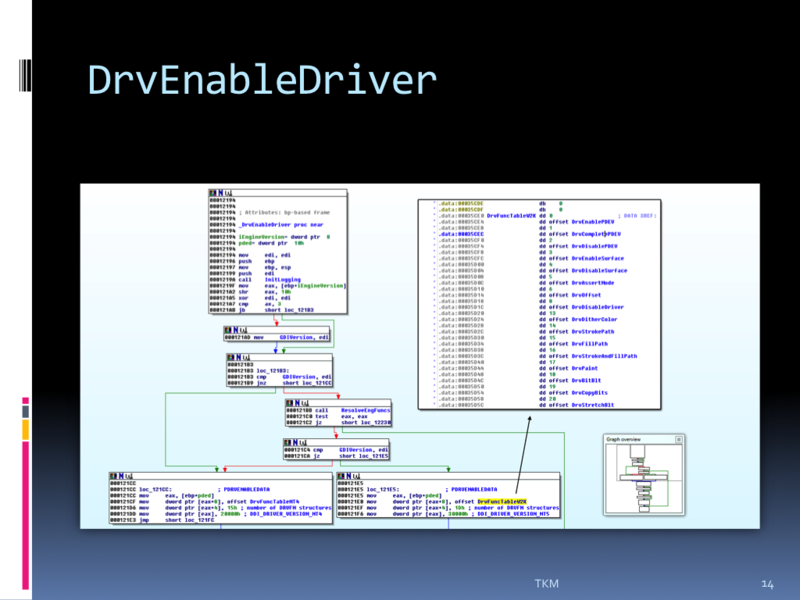 The functions implemented and supported by a display driver are defined by DrvEnableDriver (DriverEntry), whose prototype is shown below. Upon loading the driver, the OS sets the iEngineVersion according to the version of GDI that is currently running (e.g. Windows 2000 or XP). 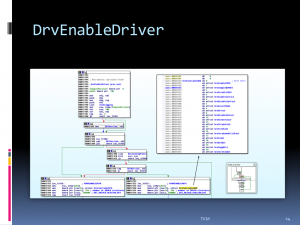 The display driver then fills the DRVENABLEDATA structure accordingly with the supported interfaces. Subsequently, upon making GDI and DirectX calls, win32k.sys and dxg.sys call the corresponding function in the display driver. Because the XPDM display driver model requires vendors to marshal great amounts of data in kernel-mode in handling large and complex Direct3D/DirectDraw structures, there is a significant probability of security vulnerabilities being present. It should be noted that the newer Windows Vista Display Driver Model (WDDM) tries to address this by moving such processing into a user-mode driver. In the event that GDI does not offer a suitable interface for say some specific graphics adapter capability, XPDM allows developers to use generic Escape calls. This enables user-mode applications to instruct the display driver to exercise specific functionality, much like the DeviceIoControl interface does in regular kernel-mode drivers. It is no secret that such interfaces should be carefully audited as they directly operate on user provided data and thus become a prime candidate for privilege escalation vulnerabilities. The XPDM display driver in VirtualBox implements the DrvEscape interface to provide information about the mode of operation, but more importantly the ability to set the visible region of a guest’s display. This is done by making a VBOXESC_SETVISIBLEREGION escape call (e.g. via ExtEscape) with a RGNDATA formatted buffer holding the array of rectangles that compose the region. The display driver copies this information to a buffer of its own before sending the information to the host. The vulnerability addressed in VirtualBox 4.0.10 was an integer overflow in multiplying the number of rectangles (cRects) with the size of a RTRECT structure (equivalent to RECT), subsequently used to determine the size of the driver allocated buffer. This in turn resulted in a kernel pool overflow as the driver later used cRects in copying the rectangles. The latest maintenance release ensures that the multiplication does not wrap by casting sizeof(RECT) to an uint64_t and that the rectangle count does not exceed 1 million. Although there’s a theoretical possibility of exploiting this vulnerability, the large copy makes it somewhat difficult. On MP systems, an attacker may be able to corrupt a kernel object or structure in the non-paged pool and trigger use of it before the copy reaches unmapped memory or triggers some other fault. As current graphics adapters do not offer virtualization of resources, providers of virtualization solutions need to abstract the graphics rendering in guests in order to offer the same 2D/3D experience you get on native systems. In VMware Workstation and Player, 3D rendering is performed by buffering commands in a shared memory between the guest and the host which the host processes and translates to OpenGL or Direct3D calls. VirtualBox takes a similar approach and uses Chromium to forward graphics calls from the guest system to the host where they are executed with hardware acceleration. In the Host-Guest Communication Manager (HGCM), VirtualBox provides the VBoxSharedOpenGL service to give guest applications more direct control of commands passed to the host. Guest applications connect to the VBoxSharedOpenGL service by opening the VBoxGuest device and using the VBOXGUEST_IOCTL_HGCM_CONNECT I/O control code. Subsequent commands are then passed by issuing HGCM calls (VBOXGUEST_IOCTL_HGCM_CALL) and specifying the service command to execute. One of the service commands (SHCRGL_GUEST_FN_WRITE_BUFFER) processed by the host service was found vulnerable to an integer overflow. The affected code is shown below. In the above code, the VBoxSharedOpenGL service does not sufficiently validate the ui32Offset parameter used in specifying the offset into a host managed buffer. If ui32Offset+cbBuffer results in a wrapped integer, the function may attempt to copy the contents of the guest supplied data at a negative offset from the allocated buffer on x86 hosts (and thus corrupting the preceding memory), or at a positive unvalidated buffer offset (+ui32Offset) on x64 systems. In order to fix this, ui32Offset was cast to uint64_t. Naturally, exploitability in this case depends on the memory allocator of the host operating system. Writing at a negative offset allows the attacker to corrupt the memory of any preceding memory allocation and may allow for arbitrary code execution if the attacker can sufficiently influence the heap state of the host process. On 64-bit hosts, the attacker may pass a very large pBuffer (cbBuffer) and thus require a small ui32Offset to pass the overflow check. This would allow the attacker to corrupt subsequently positioned memory blocks in the host process. In attempting to exploit vulnerabilities in virtualized devices such as in a guest-to-host escape scenario, an attacker is typically required to install a driver (to do raw I/O operations or manipulate device memory directly) or perform other tasks that require administrative privileges. In this particular case, no special privileges are required as the vulnerability is triggered through the VirtualBox guest device which permits unprivileged access. Although Oracle admits that the Chromium stack (not enabled by default) may open VirtualBox to security vulnerabilities, the affected component is not directly related to Chromium. In MS10-098, Microsoft patched multiple vulnerabilities reported in win32k.sys that could be leveraged by a non-privileged user to gain elevated rights on a vulnerable system. One of the vulnerabilities affected the win32k component of the WOW32 subsystem, which plays an integral role in managing and scheduling tasks (i.e. Win16 applications) in the Virtual DOS Machine (VDM). As VDM bugs historically have been of interest  to the security community, I wanted to spend some time explaining the details of this particular vulnerability. MS-DOS and 16-bit Windows applications are not natively supported by their own environment subsystems running in separate user-mode processes. Instead, they are supported by Virtual DOS Machines (VDM) that provide an execution environment that resembles native MS-DOS. The lowest 16Mb of the VDM uses 16-bit segmented addressing to access memory, and contains MS-DOS emulation code as well as MS-DOS applications. The upper areas of the VDM use 32-bit addressing, and are used to provide Win32 and Windows NT executive services normally provided by MS-DOS itself. In order to properly emulate the Windows 3.1 execution environment, threads and processes define their own dedicated WOW kernel structures. When starting a new Win16 application, CSRSS invokes the NtUserNotifyProcessCreate system call to create a WOW per thread information structure (win32k!tagWOWTHREADINFO) for the new task. 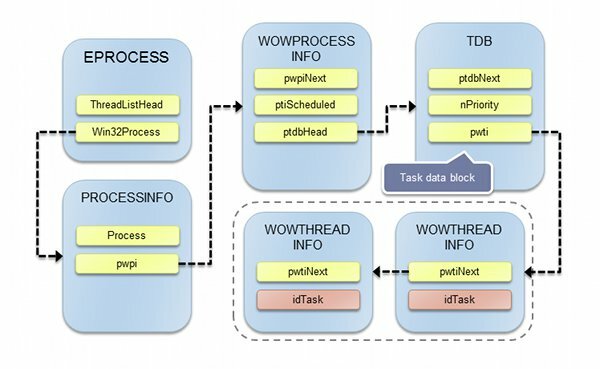 Notably, the WOWTHREADINFO structure defines a pointer to the idle event object (pIdleEvent), used in WOW task synchronization, as well as a unique id (idTask) specific to each task in a VDM. The task id is also stored at offset 0x18 in an undocumented thread data structure pointed to by NtCurrentTeb()->WOW32Reserved. As the WOWTHREADINFO structure is created upon process creation, it is actually initialized before the thread object itself is set up. When a VDM first starts up and is initialized in WOW32!W32Init, it additionally calls WOW32!WK32InitializeHungAppSupport to allocate and initialize a per process WOW information structure (win32k!tagWOWPROCESSINFO). The WOWPROCESSINFO structure is global to all tasks running in a VDM in the same way that a PROCESSINFO structure is global to all GUI threads running in a process. It holds information such as the currently scheduled task (ptiScheduled) and the list of WOW tasks (ptdbHead), sorted by priority. Each entry in the task list is represented by a task data block structure (win32k!tagTDB), shown below. The TDB is created in NtUserInitTask when a VDM calls WOW32!WK32WOWInitTask to initialize a new task. It sets the task priority (nPriority) and links the task to the WOW per-thread information structure (pwti), as well as the regular per-thread information structure (pti). The task data block structure also keeps track of pending events (nEvents), used when scheduling tasks within a VDM. In initializing a new task via NtUserInitTask within the context of a shared VDM, zzzInitTask attempts to associate the already created WOWTHREADINFO structure with the task data block structure of the new task. However, the function fails to check if the specified task id (provided in the eighth argument to NtUserInitTask) has already been initialized. Thus, in initializing a task with an id of an already initialized task, the WOW per-thread information structure is assigned to a second task. Consequently, destroying either task referencing this particular structure would cause the other task to reference freed memory. When in turn the other task is destroyed, a double free occurs. As an attacker could easily reallocate the freed memory after having destroyed the first task, the vulnerability could be leveraged to escalate privileges (e.g. by freeing an in-use object or by exploiting the kernel pool). In short, the following steps can be taken to reproduce the vulnerability. A bugcheck such as the one below should be triggered. In MS10-073, Microsoft addressed a privilege escalation vulnerability (CVE-2010-2744) in windows class data handling, affecting all supported versions of Windows. In this blog post, we will examine the details of the vulnerability as well as the changes made by the patch. Note that this vulnerability differs from the EoP used by Stuxnet on XP/2000, also addressed in MS10-073. Windows manages all user interface entities such as windows, menus, and cursors as objects. In fact, win32k has its own dedicated handle table for keeping track of all active user objects in a given session. One of the most important objects is undeniably the window object. On Windows 7, win32k.sys conveniently exports symbol information for the window object structure (win32k!tagWND), shown below. In our case, there are a few fields we want to pay closer attention to. The FNID, stored at offset 0x2A, is a constant defining the function identifier of the associated class. The FNID can be used to call any system class window procedure via NtUserMessageCall, and is also frequently used by Windows to determine if a system class window has been properly initialized (set to non-null). Also of interest is the class object pointer (pcls), stored at offset 0x64. The class defines common window attributes as well as the number of extra bytes reserved for each window (mirrored in cbwndExtra at offset 0x90). This data immediately follows a window object in memory and can be application defined or used by a system class window for class-specific data. In order to update the extra data associated with each window, an application may call SetWindowLongPtr with nIndex set to a zero-based offset. As system class windows also store kernel pointers in the extra window memory, validation has to be performed before an operation is permitted. In particular, xxxSetWindowLong (called by NtUserSetWindowLong, for instance) checks the window FNID in order to prevent malicious attempts at updating data used by the kernel. The problem with this approach is that the FNID starts out as null, hence may allow an attacker to to pre-initialize extra data (e.g. via SetWindowsHookEx) before a system class window has been properly initialized. Although this normally shouldn’t be a problem, two system class procedures were found to incorrectly handle already initialized extra window data, leading to exploitable conditions. The menu window system class procedure (xxxMenuWindowProc) is responsible for handling messages sent to menu windows. Upon receiving a WM_NCCREATE message, the menu window attempts to allocate and initialize a popup menu structure (win32k!tagPOPUPMENU), for which it stores a pointer in the extra window memory. However, if this pointer has already been initialized before the WM_NCCREATE message has been sent, the menu window procedure would use the existing pointer instead. As this pointer could have been set manually via SetWindowLongPtr (before the FNID is assigned), an attacker could fully control the popup menu structure, used in subsequent read and write operations. Moreover, destroying the window would result in the attacker controlled pointer being freed. The latter is demonstrated in the following test case. The task switch window procedure (xxxSwitchWndProc) was found vulnerable to a similar error. In processing the WM_CREATE message, the procedure failed to validate the switch window information pointer that possibly could have been pre-initialized. Consequently, any further operations involving the use of this pointer could lead to an arbitrary read or write. 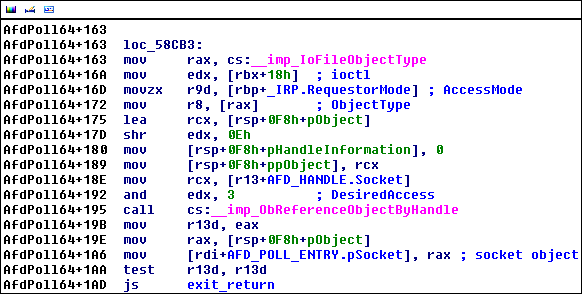 This flaw only appeared to have exploitable impact on XP/2003, as Vista and later verifies the pointers (in win32k!RemoveSwitchWindowInfo) by traversing a linked list of all active SwitchWindowInfo structures (win32k!gpswiFirst). In order to address the vulnerabilities, changes were made to the SetWindowLong APIs as well as the system class procedures. Notably, several functions now perform additional validation on the associated window class (and not just the FNID) before attempting to update extra window data. Additionally, both xxxMenuWindowProc and xxxSwitchWndProc now ensure that the extra data is null before handling the window object (and updating the FNID). This is needed as the system class pointer in a window object is never actually updated upon “converting” to a system class in the test case above. Thus, the changes made to xxxSetWindowLong would not alone be sufficient to prevent pre-initialization of window system class data.